These individuals are the glue that holds the culture together. They are routinely accessible to people of the networks when people need assistance or advice. This assistance or advice is freely given; there is no chit or payback. The assistance is based on interest and predictability, i.e. that the person will use it wisely because of who gives it. Caretakers are invisible to people outside the networks and may also belong to formal groups. They are essential to high levels of social capital in society. These individuals move information throughout the networks. They are generally in places where they come into contact with people from various informal networks and formal groups. They are especially prevalent in gathering places such as coffee shops, bars, beauty shops, restaurants, etc. They are essential for moving information quickly throughout a community when accuracy and word-of-mouth speed is needed. One of the major objectives of the Discovery Process is to insure that the people can continue to operate from facts rather than rumors. 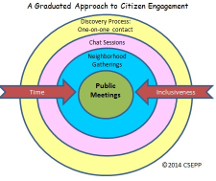 In making conscious the neighborhood processes and how to make use of them in the Neighborhood Health Center programs it was discovered that information moved through certain individuals that were located at communication intersections. Kent called them communicators since their natural function in the networks is to move information and they are relied upon by others in their networks to do exactly that. These individuals carry the culture through their stories. They provide a community with the culture benchmarks that are essential to understanding how a community can grow and still maintain the good parts of its culture. They understand the importance of gathering places, and are often the “characters” in the gathering places. Their stories embody the key values in the community and reinforce a common way of looking at the world. Kent relates that he was setting up Head Start Programs on the Navajo Reservation during the late 1960’s. He was looking for ways in which the Navajo learned, experienced life and passed on their culture. The discovery was that stories by elders and medicine people were the key mechanism. The same stories were told at different times of a person’s life and they could take from the stories what it was that they needed at this time of their life and leave the rest. These individuals function as a protective device for the informal systems, screening out intrusive people especially those from formal systems. They narrow the entry to a network or community through information control. Often they are verbal people who understand both the informal and the formal networks, and these people can be found when you ask the question: who should I talk to if I want to learn about…? They will often direct you to a narrow set of choices within the person’s sphere of influence. If a caretaker is asked that same question he or she will try to match your interest with a key person in the networks that may be helpful without regarding the sphere of influence. We often get at this network by asking: “who else should I talk to?” In applying the Discovery Process the fieldworker enters the routines of the community by essentially hanging out and doing a description. As conversations were engaged it became apparent that with some of the local people our entry to the community was being narrowed. It was discovered that this natural function was a protective devise to make sure that negatively intrusive people were not let into the culture,—would not be able to meet caretakers and communicators. These people were eventually called Gatekeepers, a word taken from small group dynamics where the gatekeeper is a well-recognized phenomenon. Kurt Lewin, who was the father of organizational development and developed the field theory of group dynamics, was probably the first researcher to use the term gatekeeper. In 1946 he launched the Research Center for Group Dynamics at the Massachusetts Institute of Technology (1947, p. 55-62). These people function in the area of knowledge and wisdom. They have knowledge and wisdom from the culture and often provide cultural interpretations to technical data and information generated by formal systems. This translation of technical data and information into practical cultural terms serves as a verification function that the data/information is only usable if it is in a cultural context. Often these individuals have one foot in the cultural context and another in a scientific context, understanding both and how to integrate them so that scientific data can be put into a useful local context. This understanding became important in the Upper Eagle Valley work since the outside environmentalists and the project proponent were interpreting the world through their eyes and not through the eyes or the knowledge of the local culture that would be negatively impacted. Several local authenticators were found in the community and successfully brought into the decision making process (Larsh, 1995, p. 57-75). 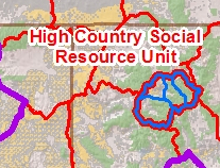 The authenticator character has been used since its discovery in all of JKA’s natural resource work, especially with the US Forest Service and the Bureau of Land Management in dealing with “warring scientists” from a local empowerment perspective (McVicker, 2000, p.1-4). These individuals act to link people together. They often have one foot in the informal system and one foot in the formal. For example; the bridger between a Latino network and those community members use of a bank, will not only know Spanish and English but will also have knowledge of the persons in the banking system that can get things done. They will also help newcomers get absorbed into the informal caretaking networks. Bridgers were discovered in the original work with the sub-cultures during the war on poverty (Kent, J., 1967, p. 103 to 112). They were the Working Class Poor who lived in the poverty neighborhood but went into the outside world to work. Therefore they had knowledge of how to access outside resources and how the outside world worked but they never desired to become a part of the outside world. They were often bi-lingual which was essential to be effective in some neighborhoods. Kent renamed the Working Class Poor, bridgers, and hired them as Family Health Counselors in his Neighborhood Health Centers and were positioned to interact with the formal medical world and the informal world of their local neighborhood. This became a new career pathway for many bridgers (Pearl, 1965, p. 52-63). These individuals are interested in self-power and gain it through positioning themselves as spokespersons for community networks. Opportunists say things like “we’ve talked it over…” and “my people…” but often they do not have the standing they claim to have. Opportunists are often the first people that you will find when entering a new community at the grass roots level. The communicators and their networks announce that new people are in the community. The opportunist will seek out the new people to check out any opportunities that they may offer for their own benefit. To agency people who are mandated to work in community this generally first contact looks like a real find. They act as though they can do anything for you, wherever and whenever you may wish. This is especially prominent in natural resource work where federal agencies must gain community participation for their programs. The opportunist attempts to block access to the other community characters maintaining that they are the “person you need to talk to”. The other community characters especially the caretaker and the communicator often use the opportunist to insure that the agency people do not get to the inside of their culture. While other community characters recognize the opportunist, they are not trusted. Kent recognized that the opportunist really wanted out of the poverty they were trapped in so he set up a program where the opportunist could work for the system essentially removing them from the obstructive position that they often represent in the community. Once in the formal system, with some status, they became insiders for the neighborhood from which they came to get things done in the agencies where the opportunists worked (Warner, & Kent., 1965, p. 104-105). These individuals know the history of their geographic place and are the carriers of the events that have happened over the lifetime of the community. They know critical information about events and people that have influenced their community over time. The historian is key to benchmarking certain times in the community when events were in harmony or disharmony and what was happening at those times. The historian first appeared in the establishment of Plane de Salud de Valle, a migrant heath project established by Kent’s group in Fort Lupton, Colorado in 1969. In order to understand the positioning of the health center building stories needed to be collected to insure that the building was in the right place physically to optimize success. While much work was done in looking at the different choices it was not until the team heard a complete history from a social ecological perspective from the indigenous historian that a decision could be made to put the Health Center in the old Japanese internment camp. The historian related the internment camp history, its creation, operation and shut down and the human as well as inhuman aspects of the camp. Once the local history (culture) was understood and the need for curing this terrible community intrusion it was a matter of consensus to put the Health Center, a healing phenomenon, at the Camp. It was not the preferred choice of the professionals, but the historian’s story set out a clear path to use the Health Center’s location and development to reprocess the old history while new, positive history was being made. Since the discovery of the historian, JKA associates find them and engage them to relate the history of the area and the processes that the new project can fit into to make its contribution. History tells you how to become grounded in the community, but it needs to be the cultural history (Kent, & Smith, American Journal of Public Health Service, 1967, p. 1-4). The implication of these characteristics is greater than a mere function of a job. The above eight community archetypes are so called because they are universal. Carl Jung said that an archetype is not what a person does or even his or her behavior but more about the way in which two people may go about the same task in a different way. How a person does what he or she does comes from the archetypal consciousness. Carl Jung places value on using archetypal characters, in that a large group of people are able to unconsciously recognize the archetype and thus the motivations behind the character’s behavior.Jung describes an archetype as “having an unlearned tendency to experience things in a certain way, a personality type that can be observed multiple times” (Psychological Types, Collected Works Volume 6. Princeton, New Jersey: Princeton University Press, 1981, p. 67). The archetype has no form of its own, but it acts as an “organizing principle” on the things we see or do (Retrieved from Shippensburg University, December 5, 2005, http://www.ship.edu/egboeree/jung.html). 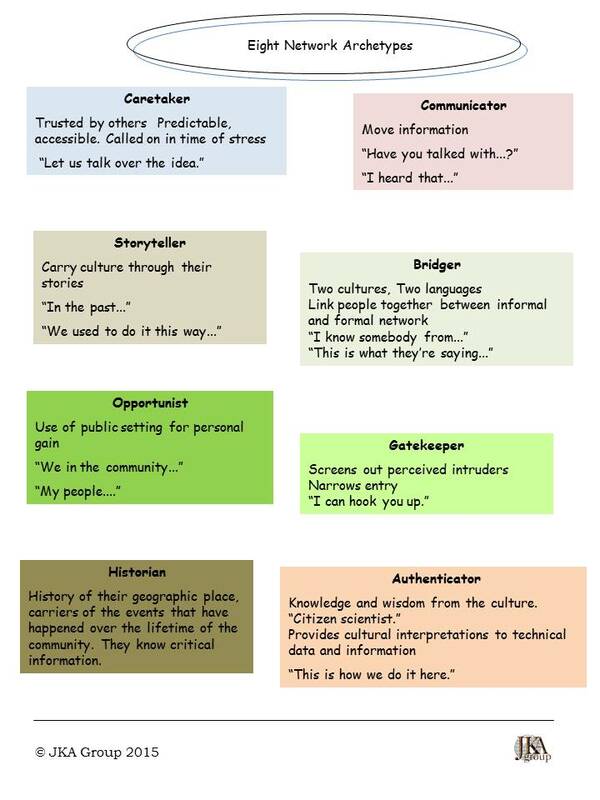 The importance of community archetypes is best seen and observed in community gathering places (Oldenberg, 1999, p.1). Gathering places within a community are where people meet and information is updated every 24 hours (Brown, 2005, p. 21). The importance of a gathering place is that the routine contact keeps the participants in the present, what is happening today and not in the past or future. Brown, J., & Isaacs, D. (2005). The World Cafe. San Francisco, CA: Berrett-Koehler Publishers, Inc.
Kent, J. A. (1965). Death of Colonialism in Health Programs for the Urban Poor, Rehabilitating the Disadvantaged Disabled. Syracuse, New York: Syracuse Medical School. Kent, J., & Smith, C. H. (1967). Involving the Urban poor in Health Services through Accommodation-The employment of Neighborhood Representatives. Boston, MA: American Journal of Public Health, 57, 997-1003. Larsh, E. B. (1995). Doc’s Lab: Myths and Legends of Cannery Row, Mack and the Boys as Consultants. Monterey, CA: PBL Publisher. Lewin, K. (1947a). Frontiers in Group Dynamics. Human Behavior. McVicker, G. (2002). Community-Based Ecosystem Stewardship (Rep.). Phoenix, Arizona: The Partnership Series National Training Center.